There’s a new way to use Chase Ultimate Rewards points. 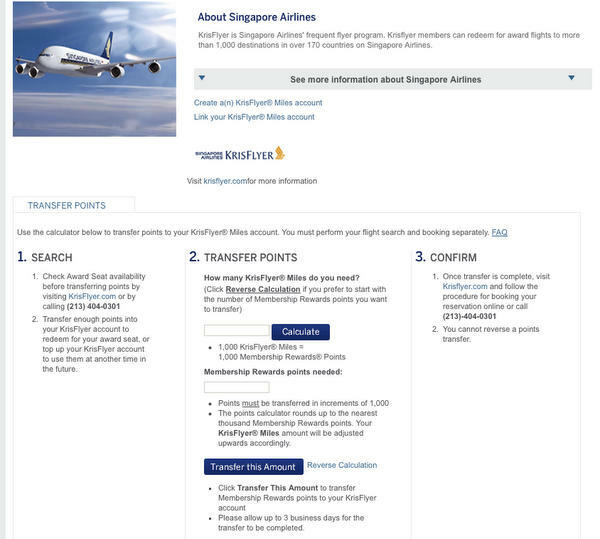 You can now transfer your points to Singapore Airlines! 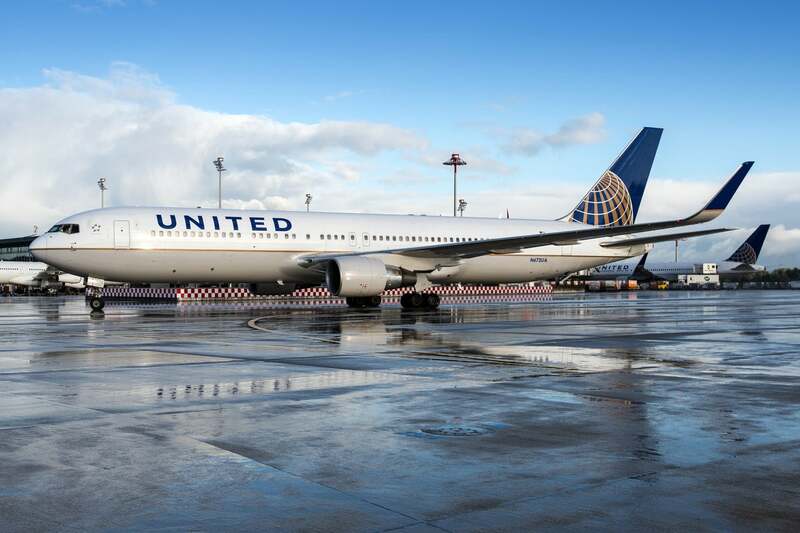 Transferring your Chase Ultimate Rewards points to Singapore Airlines can save you 10,000 miles on a round-trip flight to Hawaii on United Airlines in coach. There are some other smart ways to use your new rewards partner. But in other cases, you’ll need to watch for fuel surcharges! Singapore Airlines is a member of the Star Alliance which means you can use Singapore Airlines miles to book flights on airlines like United Airlines, Lufthansa, and Avianca. Having Singapore Airlines as a Chase Ultimate Rewards transfer partner doesn’t benefit most folks because Singapore Airlines has fuel surcharges. But there are some positives such as being able to book First Class suites and discounted flights to Hawaii which I’ll explain! Which Chase Ultimate Rewards Cards Transfer to Singapore Airlines? You can transfer your Chase Ultimate Rewards points from your Chase Ink Bold, Chase Ink Plus, or Chase Sapphire Preferred card to Singapore Airlines in a 1:1 ratio. You can get 60,000 Chase Ultimate Rewards points on the Chase Ink Bold and Chase Ink Plus cards after you spend $5,000 within 3 months. But the 60,000 Chase Ultimate Rewards points offer ends on June 1, 2014. 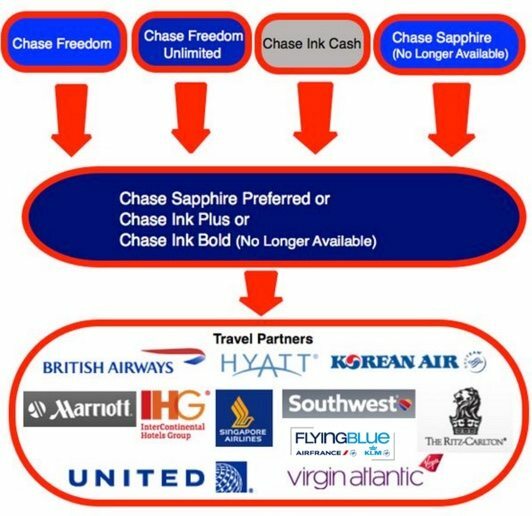 And you can transfer Chase Ultimate Rewards points from your Chase Freedom card to Singapore Airlines IF you have a Chase Ink Bold, Chase Ink Plus, or Chase Sapphire Preferred Card. Here’s my step-by-step guide to transferring your Chase Ultimate Rewards points from your Chase Freedom card to your Chase Ink Bold, Chase Ink Plus, or Chase Sapphire Preferred card. Note: It can take up to 48 hours for your Chase Ultimate Rewards points to transfer. Because award seats constantly change there’s no guarantee that the award seats will be still there in 48 hours. Are the Fuel Surcharges Worth It? You’ll pay fuel surcharges when you use Singapore Airlines miles to fly on Singapore Airlines and their partners. So it might not be worth it for coach, but it could be for Business Class or First Class. For example, for a round-trip coach award ticket from San Francisco to Hong Kong on October 23, 2014, to October 31, 2014, you would pay 51,000 Singapore Airlines miles (after the 15% discount for booking online) and ~$290 in fuel surcharges and taxes. Although, this could be worth it if there are more award seats using Singapore miles. However, for a round-trip First Class Suites award ticket from San Francisco to Hong Kong on October 23, 2014, to October 30, 2014, you would pay 140,250 Singapore Airlines miles (after the 15% discount for booking online) and ~$290 in fuel surcharges and taxes. 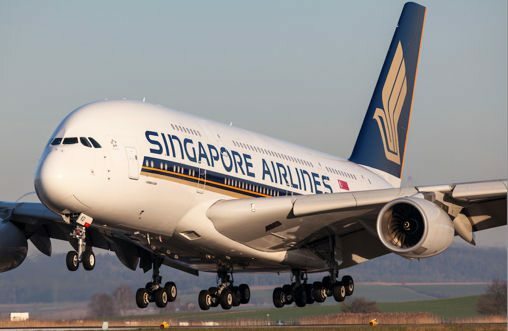 Because you pay the same amount of fuel surcharges flying in a First Class Suite as coach, it might be worth it to redeem the 89,250 extra Singapore Airlines miles (140,250 Singapore Airlines miles for round-trip First Class Suites – 51,000 Singapore Airlines miles for round-trip coach). Although Singapore Airlines charges fuel surcharges when you use Singapore Airlines miles, they do NOT charge fuel surcharges on United Airlines flights. So you can use your Singapore Airlines miles on United Airlines flights and avoid fuel surcharges. And you get a better value using Singapore Airlines miles on United Airlines instead of using United Airlines miles for certain flights. 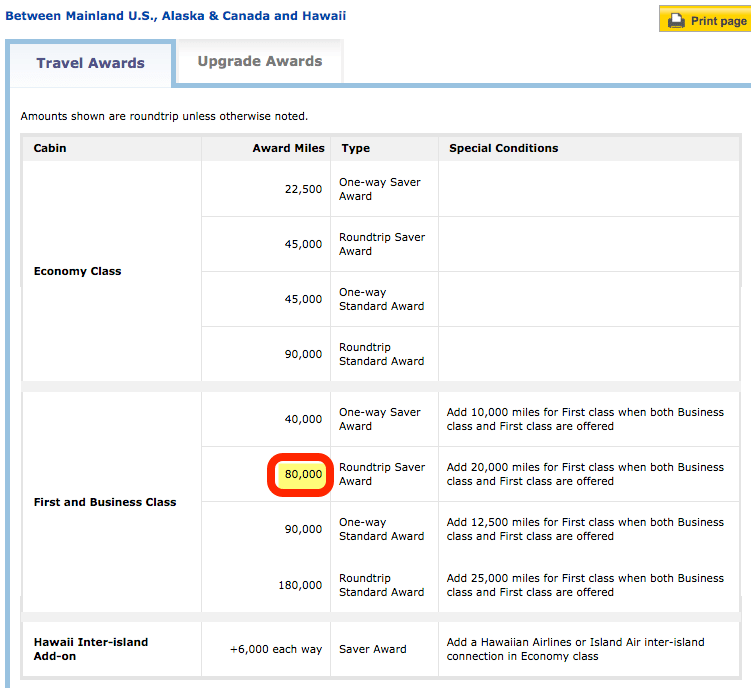 For example, a round-trip saver award ticket from the US to Hawaii in coach costs 45,000 United Airlines miles. But it only costs 35,000 Singapore Airlines miles! 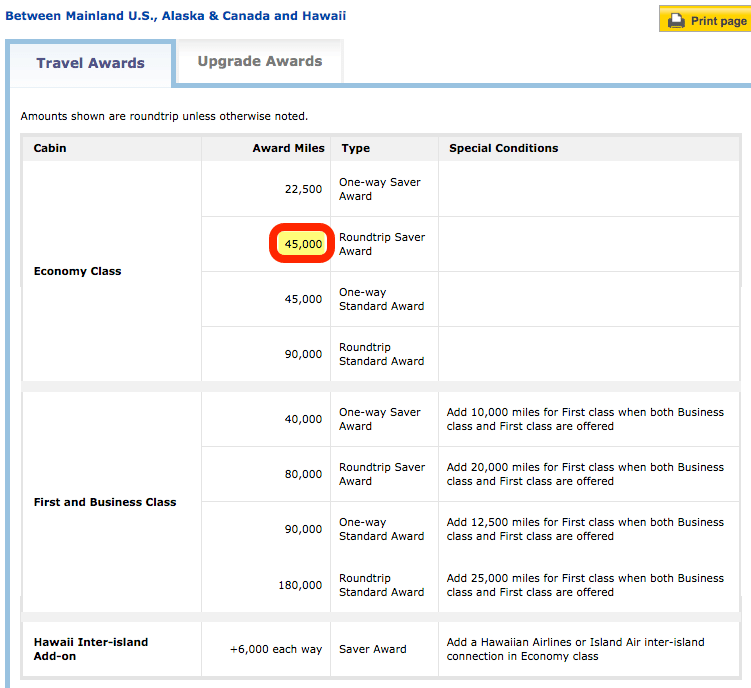 And from the US to Hawaii in Business/First Class you’ll pay 80,000 United Airlines miles. But you’ll only pay 60,000 Singapore Airlines miles. To book partner awards you have to call Singapore Airlines at 800-742-3333. You get a 15% discount when you book your Singapore Airlines award tickets on the Singapore Airlines website. In my examples above, I included the 15% discount. But let’s look at what it would cost without the 15% discount. 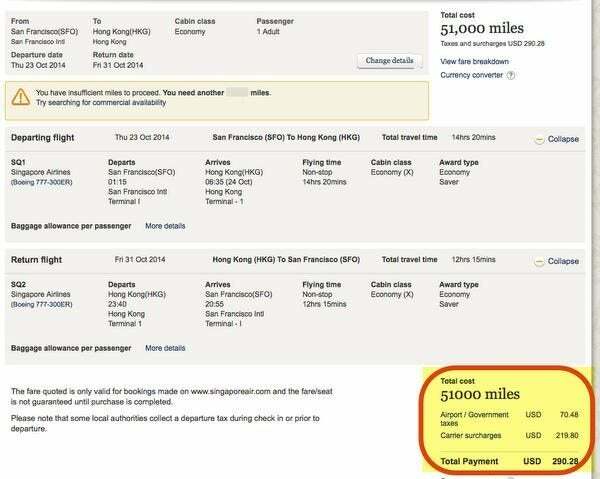 For a round-trip coach award ticket from San Francisco to Hong Kong on October 23, 2014, to October 31, 2014, you would pay 60,000 Singapore Airlines miles and ~$290 in fuel surcharges and taxes. This is compared to the 51,000 Singapore Airlines miles you’d use by booking online. You can pay fewer Singapore Airlines miles by booking 1-way award tickets. 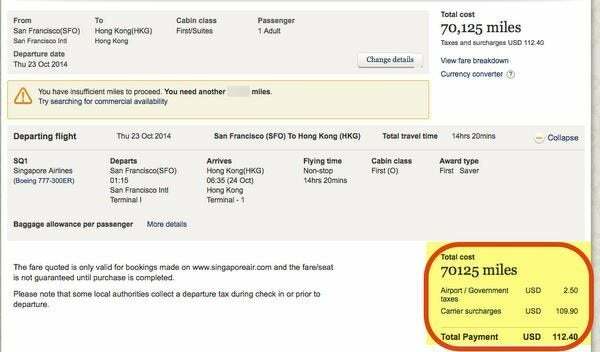 So for a 1-way First Class Suites award ticket from San Francisco to Hong Kong on October 23, 2014, you would pay 70,125 Singapore Airlines miles and ~$112 in fuel surcharges and taxes. It costs 20,000 Singapore Airlines miles for a 1-way award ticket from the US East Coast and Houston to Europe. And if you book online, it’s only 17,000 miles. You can fly from New York JFK to Frankfurt, or from Houston to Moscow on Singapore airlines! 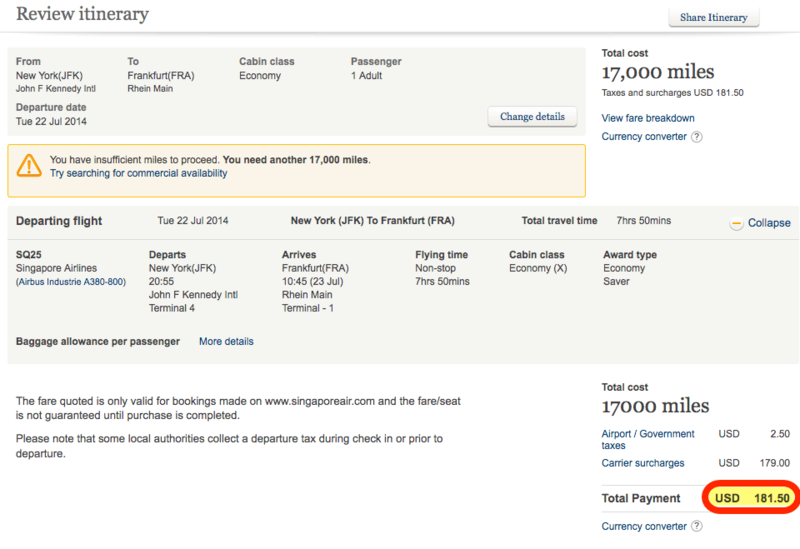 You’ll pay ~$182 in fuel surcharges, but there are lots of award seats available. To compare, you’d pay at least 30,000 miles 1-way using United Airlines miles, but the surcharges would be much less. You can transfer American Express Membership Rewards points to Singapore Airlines in a 1:1 ratio in 1,000 point increments. Because you’re transferring American Express Membership Rewards points to a foreign airline, you do NOT pay an excise fee as you would if you transferred to a US airlines. You can transfer Starwood points to Singapore Airlines in a 1:1 ratio. When you you transfer in increments of 20,000 Starwood points, you get a 5,000 point transfer bonus. So you can transfer 25,000 Starwood points to Singapore airlines and get a 5,000 point bonus, giving you 30,000 Singapore airline miles. But if you transferred 15,000 more Starwood points (i.e. 40,000 Starwood points) you would get 50,000 Singapore airline miles (i.e 10,000 more miles). You can transfer Chase Ultimate Rewards points from your Chase Ink Bold, Chase Ink Plus, and Chase Sapphire Preferred card to Singapore Airlines at a 1:1 ratio in 1,000 increments, but it can take 48 hours to transfer. So you might lose your seats while waiting. You’ll pay fuel surcharges when you use Singapore Airlines miles on Singapore Airlines and their partners. But when you will NOT pay fuel surcharges when you use your Singapore Airlines miles to fly on United Airlines. You’ll pay only 60,000 Singapore Airlines miles to fly round-trip First Class to Hawaii instead of 80,000 United Airlines miles. And in coach, you’ll pay 35,000 Singapore Airlines miles instead of 45,000 United Airlines miles. You get a 15% discount on the cost of an award ticket when you book on the Singapore Airlines website. But you can’t book partner awards online. American Express Membership Rewards and Starwood points also transfer to Singapore Airlines at a 1:1 ratio. Which Singapore Airlines awards are you going to redeem your Chase Ultimate Rewards points for? Thanks for all of the great information! 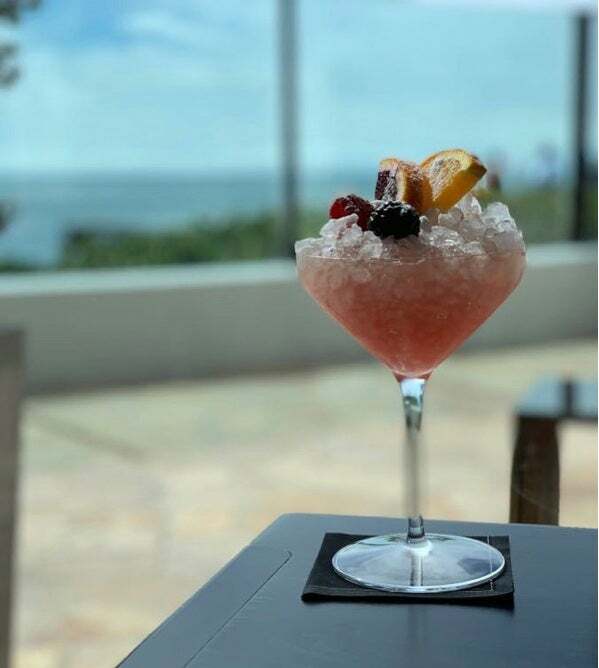 I’m wondering if I can transfer points from a Chase Sapphire card and a CitiThankYou Premiere card to Singapore Airlines and then book a trip on United Airlines from Salt Lake City to San Juan, Puerto Rico? Would that work? I’m glad I accidentally stumbled upon your blog! Great stuff! Problem is I now have another addiction. 😛 I used to be a member of KrisFlyer and I did manage to use my miles to travel business class on SQ which was beyond awesome. I then took heed of the many travel gurus suggesting that I switch to MileagePlus. I reached Premier Gold and I’ve enjoyed the perks. I travel twice a year from New York to Perth, Australia so I achieving Gold on either SQ or UAL is no problem. 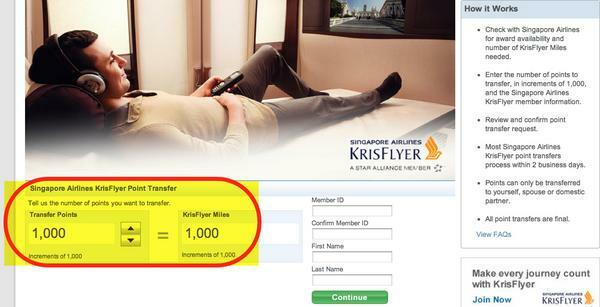 With the mileage devaluation concerning MileagePlus, do you think it’s worth switching back to KrisFlyer? The spend requirements for elite status on UA don’t apply to me as I’m not a US citizen but live in the US. I’ll still always be Premier Gold at the very least. I’m also told that I won’t be competing with as many elite members for upgrades. Somehow, I think KrisFlyer is the better choice aside from the crappy fuel surcharges and way more expensive ticket than United to Perth. $2260 on SQ versus $1700 on UA. What do you think? Keep flying United and credit to KrisFlyer? Thanks in advance for your reply! @Jim – Welcome! Between the higher fuel surcharges and more expensive tickets, I’d still pick United. However, if you redeem your miles for business or coach tickets, Singapore could be more appealing! I am seeing no availabilty for saver award in first class/suites and only standard award availabilty in business on Singapore, even very far out; thus redemption options are pricey in term of miles. @Mark – The standard awards are pricey! @Capri – It should take only a few days. Does anyone have any experience with how long it takes in actual practice for transferred UR points to post to a KrisFlyer account? When I sent some AmEx MR points over, it took a few days. A little more than 48 hours, maybe 72. Since the Citi ThankYou transfer partnership is so new, I suspect no one will have transferred yet with receipt on the KrisFlyer side, but it’d be nice to hear anecdotes of transfer times there too. P.S. Re: my own post above. I’ve opted to get back from Morocco after my EU marathon runs to Hawaii on a new AA award, and will do LAX-NRT-SIN early next year on SQ F (Suite). I’ve found some availability (not Waitlist, woohoo!) that fits my timeframe. Just need to decide which points currency to transfer from and get them on their way to KrisFlyer. I have 50K’ish SPG, 150K or so UR, 25K left in AmEx MR, and 45K or so Citi TY. Need 34K in fresh KF miles to top off for the award. Any suggestions from other readers?